Despite advances in understanding the roles of adiposity, food intake, GI and adipocyte-related hormones, inflammatory mediators, the gut–brain axis and the hypothalamic nervous system in the pathophysiology of obesity, the effects of different therapeutic interventions on those pathophysiological mechanisms are controversial. There are still no low-cost, safe, effective treatments for obesity and its complications. 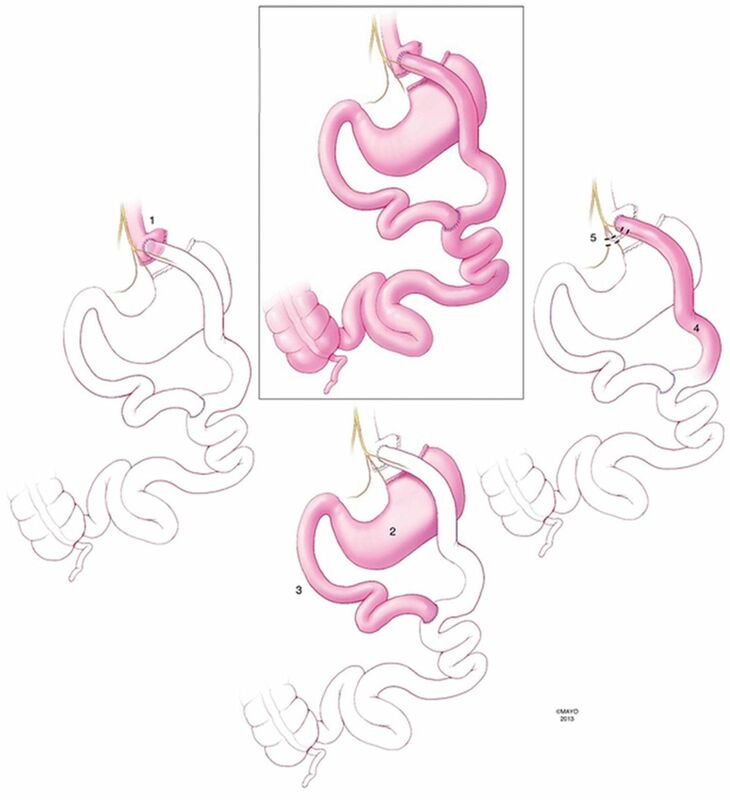 Currently, bariatric surgical approaches targeting the GI tract are more effective than non-surgical approaches in inducing weight reduction and resolving obesity-related comorbidities. However, current guidelines emphasise non-surgical approaches through lifestyle modification and medications to achieve slow weight loss, which is not usually sustained and may be associated with medication-related side effects. This review analyses current central, peripheral or hormonal targets to treat obesity and addresses challenges and opportunities to develop novel approaches for obesity. The search for effective treatments for obesity has led to a greater understanding of adiposity, GI and adipocyte-related hormones, inflammatory mediators, the gut–brain axis and the hypothalamic nervous system involved in appetite regulation (figure 1). The effects of different interventions on the pathophysiological mechanisms of obesity are the subject of ongoing research. Understanding the pathophysiological mechanisms of obesity provides an opportunity to develop novel approaches to treat, at relatively low cost and enhanced safety, the ever-expanding population of obese people. Complex mechanism of food intake regulation. The food intake process initiates when nutrients enter the GI tract. Digestion starts when the nutrients enter the stomach and produce mechanic-dilation decreasing acyl-ghrelin and increasing desacyl-ghrelin and gastric leptin. Stomach dilation sends signals through the vagus nerve and peripheral nervous system to the brainstem and hypothalamus. The digested nutrient passes to the small intestine and colon producing further mechanic-dilation, GI hormones release, bile acid and pancreatic juices secretion. These GI hormones have a local effect (paracrine) and peripheral effect, when secreted into circulation, passed through the liver and affect the muscle, adipose tissue, GI motility and function, and nucleus of the hypothalamus and brainstem. The paracrine and endocrine effect induces satiation and satiety. The muscle and adipose tissue release hormones which affect similar nuclei in the brain. The effect on the hypothalamus and brainstem trigger higher brain area responses, modulating behaviour and enhancing nutrient-related reward. In the hypothalamus, first order neurons in the arcuate nucleus (ARC) modulate appetite by NPY/AGRP pathway and satiation by the POMC/CART pathway. The neurons interact with second order neurons in the Paraventricular nucleus (PVN) and Lateral hypothalamic (LHA) area to send signals to higher brain areas and to the brainstem. In the brainstem, the Nucleus of the tractus solitarius (NST) and dorsal vagal complex (DMNV) interact with the periphery and GI system and brings signals to the higher brain areas and the hypothalamus. Abbreviations in alphabetical order: 5-HT, serotonin; ACTH, adrenocorticotropic hormone; AGRP, agouti-related peptide; ARC, arcuate nucleus; AVP, arginine vasopressin; BA, bile acids; CART, cocaine- and amphetamine-regulated transcript; CCK, cholecystokinin; CRH, corticotropin-releasing hormone; D, dopamine; DMNV, dorsal vagal complex; FGF, fibroblast growth factor -19; GABA, gamma-aminobutyric acid; GLP-1, glucagon-like peptide-1; IL-6, interleukin-6; LHA, lateral hypothalamic; MSH, melanocortin stimulating hormone; NA, noradrenaline; NPY, neuropeptide Y; NST, nucleus of the tractus solitaries; NT, neurotensin; OT, oxytocin; Orex, orexin; OXM, oxyntomodulin; PP, pancreatic polypeptide; PVN, paraventricular nucleus; peptide tyrosine–tyrosine (PYY3)-36, peptide tyrosine-tyrosine 3-36; POMC, proopiomelanocortin; TNF, tumour necrosis factor; TRH, thyroid-releasing hormone; TSH, thyroid-stimulating hormone. References for this review were identified through searches in PubMed for articles published from June 1974 to August 2013 by use of the terms “brain-gut axis”, “food intake”, “vagus nerve”, “GI hormones”, “treatment”, “guidelines”, “bariatric surgery”, “gastric sleeve”, “sleeve gastrectomy”, “biliopancreatic diversion” and “endoscopic weight loss procedures” in combination with the term “obesity”. Articles resulting from these searches and relevant references cited in those articles were reviewed. Articles published in English were included. Despite proven efficacy and the fact that mortality from bariatric surgery is comparable to that of cholecystectomy or appendectomy in bariatric centres with high surgical volumes, it is estimated that less than 1% of obese subjects who qualify for bariatric surgery will undergo such intervention.18 High costs and early and late complications of bariatric surgery are the main hurdles for widespread use. Early complications include anastomotic leaks, internal hernias, thromboembolic events, bowel obstruction, GI haemorrhage and wound complications. Late complications include gallstones formation, marginal ulceration, anastomotic stricture, incisional hernia, gastro-gastric fistula, dumping syndrome, micronutrient deficiencies and weight regain. Given the current state of therapies for obesity, it is timely to question the 1998 guidelines that recommend slow weight loss with non-surgical approaches that produce modest and poorly sustained efficacy and potential centrally mediated side effects. 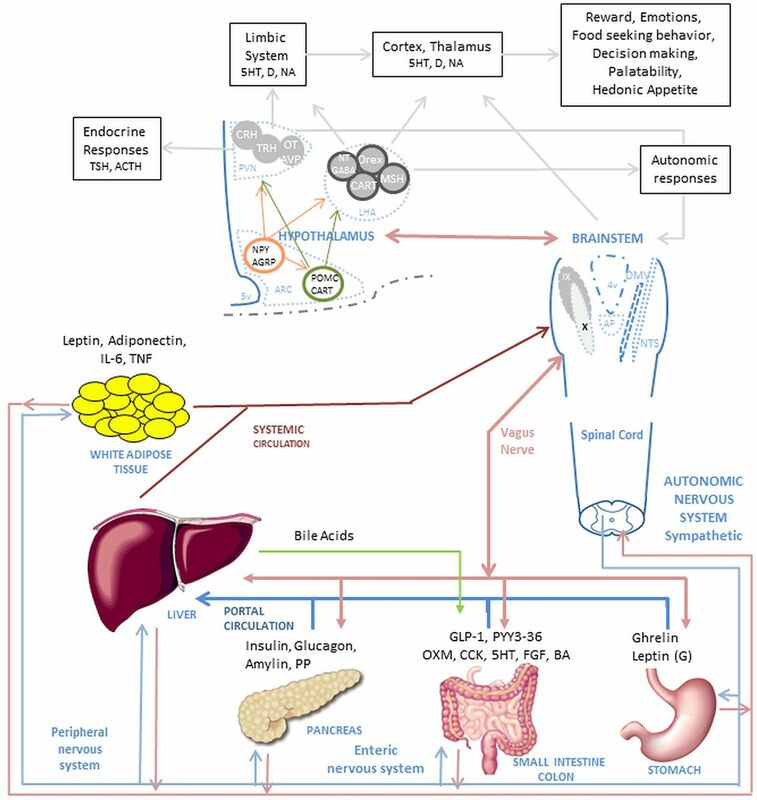 The next sections review advances in our understanding of central and peripheral pathways controlling energy intake and expenditure in that order and discuss the potential to develop effective, minimally invasive treatments for obesity. The CNS coordinates a complex and dynamic process to regulate energy balance. Food intake, appetite and satiation are mainly regulated by the gut–brain axis,21 ,22 that is, gut hormones, the vagal complex, brainstem, medial basal hypothalamus and higher cortical brain centres.21 The current overarching hypothesis is that appetite is stimulated by the secretion of acyl-ghrelin (AG) from the stomach during the fasting period. Ghrelin acts on specialised neurons in the arcuate nucleus of the hypothalamus to activate the agouti-related peptide/neuropeptide Y (AgRP/NPY) pathway.23–25 This pathway is responsible for stimulating appetite centres in the cerebral cortex that are involved in food-seeking behaviour and prepare the GI tract for food intake by a vagal response.26 Satiation (or the feeling of fullness after meal ingestion) and satiety (absence of appetite) are induced by several hormones including leptin, insulin, glucagon, cholecystokinin, peptide YY, oxyntomodulin (OXM) and glucagon-like peptide-1 (GLP-1), which are secreted from the adipose tissue, pancreas and GI tract after food intake. These gut hormones inhibit the AgRP/NPY pathway in the arcuate nucleus and stimulate the POMC/α-melanocyte stimulation hormone (αMSH) pathway.22 ,27 The neurons in the arcuate nucleus are called ‘first-order’ neurons because of their ‘direct’ contact with peripheral hormones that mediate satiation or satiety. ‘Second-order’ neurons arise from the paraventricular nucleus, lateral hypothalamic area and ventromedial nucleus of the hypothalamus.28 Through projections caudally to the NST and DMNV in the brainstem, these second order neurons stimulate the gastric vagal efferent fibres to delay gastric emptying by stimulating intra-gastric nitric oxide system (NOS) neurons, thus decreasing motility.29 ,30 Second-order neurons also increase energy expenditure by inducing hyperthermia,31 ,32 and cranially directed neurons stimulate higher brain centres and produce food reward or feeling of well-being after a meal.30 ,32–36 These neuronal circuits ultimately control energy intake and expenditure by interacting with the GI tract, peripheral nervous system and adipose tissue. In humans, less invasive methods have been developed to study these hypothalamic nuclei. Ideally, one would like to measure the electrical activity (action potentials) in these nuclei before, during and after eating to determine their signalling mechanisms. Unfortunately, this is not possible with current techniques. A surrogate measure of neural activity is blood flow, specifically, as a brain area becomes electrically active, blood flow increases to supply oxygen and glucose and remove carbon dioxide. Brain blood flow can be measured using MRI. Three general imaging techniques are available for measuring blood flow to the hypothalamus, each with their own strengths and limitations. The primary challenge for each of these techniques is the small size of the hypothalamic nuclei; for example, each half of the hypothalamus is only 3–4 mm thick, and the arcuate nucleus is a cell cluster within the hypothalamus measuring only a few hundred microns in diameter. MRI systems with higher magnetic field strengths (eg, 3 tesla (T), 7 T) are more beneficial for imaging the hypothalamus as they have the higher resolution necessary to accurately measure such small structures. Contrast-enhanced perfusion imaging is the most common MR technique to measure blood flow and has the highest resolution. However, this technique requires an intravenous bolus injection of gadolinium contrast and, therefore, can only be performed once per day due to potential renal toxicity. ‘Functional MRI’ is a technique that measures relative changes in blood flow between two different alternating experimental conditions. However, this technique is better suited to experimental designs where the two conditions are varied relatively rapidly (on the timeframe of seconds); most studies of hunger and satiety occur in a timeframe of minutes and cannot easily alternate between different conditions. Furthermore, this technique is susceptible to artefacts from the sphenoid and ethmoid sinuses that limit evaluation of the hypothalamus. Pulsed arterial spin labelling (PASL) is an MR technique that labels blood with a magnetic ‘tag’ as it enters the skull and images it in the brain a short time later. PASL is ideally suited for the study of the hypothalamus as it: (1) does not require intravenous contrast and therefore can be performed many times over a few hour period; (2) does not suffer from significant susceptibility artefact; (3) yields highly reliable and reproducible quantifiable measurements of blood flow; and (4) using a 3 T MRI scanner, has sufficient resolution to measure global hypothalamic blood flow while minimising the influence of neighbouring areas. As it is a relatively new MRI technique, only a few PASL studies of obesity have been performed to date. For example, PASL was used to measure absolute blood flow changes in different regions of the brain in response to stimuli such as ingestion of different simple sugars; thus, there is differential stimulation of hypothalamic regions with glucose and fructose.39–41 This approach has the potential to understand the activation of anatomical regions of the hypothalamus in response to nutrients during postprandial satiation. With the introduction of MRI with PASL, it may be possible to clarify whether there are changes in the hypothalamic activity in humans during different stages of the postprandial period (cephalic, gastric and enteric) as well as in response to pharmacological, behavioural or surgical interventions. The continuing challenge is to develop CNS targeted therapies that avoid effects on pathways unrelated to energy intake in the higher brain centres that may serve other physiological and psychological functions. Using novel imaging technologies, there is potential to appraise the responsiveness of specific hypothalamic and other brainstem and brain centres to macronutrients, a nutrient-poor or nutrient-rich environment, and to therapy directed at these redundant and complex pathways. The vagus nerve innervates most of the regions of the GI tract involved in energy intake, satiation and digestion,30 and it serves as a crucial link between the brain, brainstem and gut. The afferent neuronal fibres of the ventral and dorsal vagal trunks in the abdomen are involved in regulating appetite and satiation. The vagus nerve is directly stimulated by mechanical stretch or change in viscus tension when food, or later chyme, passes through the lumen of the GI tract. The vagus nerve is also stimulated indirectly by neurohormonal mechanisms activated by the same mechanical and chemical stimuli arising from the gut. In the stomach, ghrelin secretion inhibits afferent vagal fibres to induce appetite—an orexigenic effect. Leptin secreted in the stomach stimulates vagal fibres and induces satiety—an anorexigenic effect. In the rest of the GI transit of chyme, the vagal afferent fibres are stimulated by other anorexigenic hormones such as cholecystokinin (CCK), GLP-1 or peptide YY. Efferent vagal neuronal fibres control much of the motor and secretory apparatus of the digestive tract involved in food digestion and absorption. Partial vagotomy, or total sub-diaphragmatic vagotomy, or intermittent vagal nerve electrical stimulation to inhibit vagal function in humans51 decreased food intake and induced early satiety and weight loss. The vagus nerve plays a dual role, interacting with anorexigenic and orexigenic pathways. These interactions appear to be altered in obesity.52 Greater understanding of methods to modulate vagal activity to induce weight loss could conceivably arise through stimulation of the anorexigenic pathway or inhibition of the orexigenic pathway. Clearly, further studies are needed to understand the effect of the vagus nerve in weight loss and glycemic control. Bariatric surgery, especially RYGB, has thus far proved to be the most effective intervention for obesity and type 2 diabetes. The exact mechanism by which RYGB exerts its effects on weight loss and glycemic regulations is not fully understood; the timing of resolution of diabetes suggests that RYGB's effects on diabetes are independent of the degree of weight loss. Animal and human studies suggest that the restriction of food reservoir and malabsorption is insufficient to account for RYGB's effects to enhance satiation and satiety, improve food seeking behaviours and food selection, increase energy expenditure and improve glucose homeostasis.53–55 Thus, further studies are required to clarify physiological alterations in gut neuroendocrine signalling, GI motility, autonomic nervous system signalling, bile acid production and absorption, gut microbiota and other potential interactions with the CNS, pancreas, liver, muscles and adipose tissue in response to RYGB. RYGB surgery is a complex procedure with at least five distinct components, all of which may have biological relevance in the induction of weight loss or ameliorating hyperglycaemia: (1) isolation of the gastric cardia by creation of a small gastric pouch, (2) exclusion of the distal stomach from contact with food, (3) exclusion of the proximal intestine from contact with food, (4) exposure of the jejunum to partially digested nutrients and (5) partial vagotomy (figure 2). Each of these distinct components of RYGB has the potential to alter appetite, energy absorption and expenditure, and glucose homeostasis; thus, replication of these individual anatomic alterations can be novel approaches to develop peripherally targeted treatments for obesity. The next section analyses each of these distinct components. Biological relevance of Roux-en-Y gastric bypass (RYGB) surgery. RYGB is a complex procedure with at least five distinct components, all of which may have biological relevance in the induction of weight loss or ameliorating hyperglycaemia: (1) isolation of the gastric cardia by creation of a small gastric pouch, (2) exclusion of the distal stomach from contact with food, (3) exclusion of the proximal intestine from contact with food, (4) exposure of the jejunum to partially digested nutrients (5) and partial vagotomy. Isolation of the gastric cardia and exclusion of the distal stomach may initially limit caloric intake by induction of nausea (and rarely vomiting), thereby discouraging overeating. In addition, the stimulation of the gastric mechanical and chemical receptors, rapid pouch emptying and release of ghrelin may also contribute to the induction of weight loss.56 ,57 Ghrelin is a peptide produced from the pre-pro ghrelin gene, mainly in the stomach. It is known to increase gastric emptying and to undergo cyclical changes in blood concentrations in the fasting and postprandial periods, being highest during fasting. AG is metabolised by the ghrelin activating enzyme, ghrelin-O-acyltransferase (GOAT), to deacyl-ghrelin (DAG). AG and DAG have different physiological effects: AG increases gastric emptying and appetite, whereas DAG decreases gastric emptying, induces postprandial fullness, and improves insulin sensitivity.58 The published literature suggests there is a decrease in plasma ghrelin post-RYGB, with attenuation of the cyclical changes in ghrelin levels.59 ,60 The literature is unclear about effects of AG or its metabolite, DAG, whose actions are different, as detailed above. Thus, the contribution of the changes in plasma ghrelin concentrations to the clinical efficacy of RYGB requires further investigation. Patients who undergo DJB have greatly improved glycemic control with only minimal effect on body weight.64 ,65 However, diabetes remission rates are much lower after DJB compared with traditional RYGB, suggesting that other effects of RYGB are important in weight loss and that diabetes remission rates may be proportional to the degree of weight loss.66 On the other hand, vertical sleeve gastrectomy (VSG) does not bypass the duodenum and produces significant weight loss and glycemic improvement. In a randomised controlled trial, VSG was associated with weight loss comparable to that observed with RYGB.67 The incretins and insulin-glucose responses were also similar 3 months after the procedures, although RYGB had a greater response than VSG earlier than 3 months postsurgery.68 The potential additional role of the bypassed duodenum in ameliorating glycemic control, independent of the effects of incretins, is supported by a recent meta-analysis which showed that RYGB surgery produced a higher rate of remission of type 2 diabetes when compared with VSG (OR 2.46 CI 1.48 to 40.9).69–72 Further studies are needed to understand the differences in these bariatric surgeries and to ascertain if the glycemic improvement is due to weight loss alone or whether the bypass of the duodenum is really necessary. Within the mucosa of the small intestine, enteroendocrine cells express functional gustducin-coupled sweet taste receptors that ‘taste’ luminal nutrients and release gut peptides that mediate satiety and enhance insulin secretion (incretins).73 ,74 These peptides exert their effects through interaction with the afferent vagal and spinal nerve fibres innervating the gut, or by entering the blood stream to function as hormones, influencing the area postrema or hypothalamic areas through the locally permeable BBB. GLP-1 is the major known incretin, synthesised from the enteroglucagon or pre-proglucagon gene in the enteroendocrine L-cells, which are located in the proximal small bowel, but are more abundant in the distal small bowel and colon.75 In addition to GLP-1, the enteroglucagon gene encodes multiple peptides involved in energy balance and glycemic control; these include glucagon and OXM. Quantifying the contribution of the rise in GLP-1 and other incretins to the therapeutic effects of RYGB and weight-independent improvement in glycemic control requires further study. While further information may lead to novel applications of incretins in weight loss therapy, experience with GLP-1 and intranasal PYY3–36 suggests that adverse effects such as nausea may limit the potential clinical efficacy. The vagus nerve enters the abdomen from the oesophageal plexus as anterior and posterior nerve trunks. Denervation of sub-diaphragmatic branches of these trunks may occur after RYGB. The contribution of this denervation to weight loss and metabolic changes after RYGB is unclear. Through the actions of melanocortin-4 receptors (MC4R) in the DMNV and thoracic sympathetic preganglionic neurons, the autonomic nervous system plays an important role in the improved insulin sensitivity and enhanced energy expenditure after RYGB.97 Furthermore, a variant in the human MC4R (I215 L) locus that enhances basal activity of the receptor is associated with improved outcomes after RYGB. The peripheral signals mediating enhanced activation of central MC4R signalling are yet to be identified.98 Further studies are needed to understand the role of MC4R signalling in satiety. In summary, the effects of bariatric surgery are fundamentally different from those of restrictive diets. The latter often lead to physiological responses to weight loss that actually increase hunger and decrease energy expenditure, resulting in regain of the lost weight.1 ,99 The long-term efficacy of RYGB provides a paradigm shift in our understanding of the physiological mechanisms of reduced appetite and weight loss and the physiological responses which differ from those operant in diet-induced weight loss. The success of RYGB encourages focus on therapeutic approaches in obesity directed at the GI tract. The previous discussion suggests five anatomical alterations may mediate the effects of RYGB on energy intake and expenditure. It also suggests that a multitude of physiological adaptations in the homeostatic mechanisms involved in body weight regulation may need to be addressed to overcome the compensatory responses leading to weight regain seen with restrictive diets. Duodenal-jejunal bypass sleeve. The duodenal-jejunal bypass sleeve deploys in the duodenal bulb, this impermeable fluoropolymer sleeve extending 60 cm into the small bowel creates a mechanical barrier that allows food to bypass the duodenum and proximal jejunum, thus potentially manipulating the enteroinsular system (EndoBarrier, GI Dynamics, Lexington, Massachusetts, USA). The obesity epidemic requires concerted effort, including behavioural, societal, legislative and therapeutic interventions. We have focused on the therapeutic interventions and identified challenges and opportunities to impact the unmet needs with non-surgical interventions (table 1). Despite the impact of bariatric surgery, we believe that further insights on vagal, hypothalamic and GI hormonal control are key to the development of interventions that can be applied in the large number of eligible patients with obesity and metabolic syndrome. It is also conceivable that future interventions targeting the microbiome or intraluminal mechanisms such as interference with intraluminal digestion or bile acid-related augmentation of incretin responses (not discussed here) may be feasible, peripherally-directed therapies. Meanwhile, the search for the magic bullet in central control mechanisms will continue, though it remains paradoxical that, despite all the drug development programmes being centred on hypothalamus or central mechanisms controlling appetite, the peripheral targets of bariatric surgery constitute the most salient direction for practical and effective obesity treatment at present. We thank Cindy Stanislav for secretarial assistance.
. Long-term weight-loss maintenance: a meta-analysis of US studies. Am J Clin Nutr 2001;74:579–84.
. Review of the key results from the Swedish Obese Subjects (SOS) trial—a prospective controlled intervention study of bariatric surgery. J Intern Med 2013;273:219–34. Cardiovascular Effects of Intensive Lifestyle Intervention in Type 2 Diabetes. N Engl J Med 2013;369:145–54.
. Clinical guidelines on the identification, evaluation, and treatment of overweight and obesity in adults: Executive summary. Am J Clin Nutr 1998;68:899–917.
. Reduction in the incidence of type 2 diabetes with lifestyle intervention or metformin. N Engl J Med 2002;346:393–403.
. Reduction in weight and cardiovascular disease risk factors in individuals with type 2 diabetes: one-year results of the look AHEAD trial. Diabetes Care 2007;30:1374–83.
. Serotonin 2C receptor activates a distinct population of arcuate pro-opiomelanocortin neurons via TRPC channels. Neuron 2011;71:488–97.
. Multicenter, placebo-controlled trial of lorcaserin for weight management. N Engl J Med 2010;363:245–56.
. Controlled-release phentermine/topiramate in severely obese adults: a randomized controlled trial (EQUIP). Obesity (Silver Spring, Md) 2012;20:330–42.
. Lorcaserin, a novel selective human 5-hydroxytryptamine2C agonist: in vitro and in vivo pharmacological characterization. J Pharmacol Exp Ther 2008;325:577–87.
. Hallucinogens. Pharmacol Ther 2004;101:131–81.
. Appetite suppressants and valvular heart disease. N Engl J Med 1998;339:765–6.
. Possible role of valvular serotonin 5-HT(2B) receptors in the cardiopathy associated with fenfluramine. Mol Pharmacol 2000;57:75–81.
. Function of the serotonin 5-hydroxytryptamine 2B receptor in pulmonary hypertension. Nat Med 2002;8:1129–35. FDA approves weight-management drug Qsymia. In: Administration USFaD, ed., 2012.
. Bariatric surgery worldwide 2003. Obes Surg 2004;14:1157–64.
. Metabolic/bariatric surgery Worldwide 2008. Obes Surg 2009;19:1605–11.
. Metabolic/Bariatric surgery worldwide 2011. Obes Surg 2013;23:427–36.
. The blood-brain barrier: connecting the gut and the brain. Regul Pept 2008;149:11–14.
. Characterizaton of short isoforms of the leptin receptor in rat cerebral microvessels and of brain uptake of leptin in mouse models of obesity. Endocrinology 2002;143:775–83.
. Gut hormones: a weight off your mind. J Neuroendocrinol 2008;20:834–41.
. Regulation of food intake by gastrointestinal hormones. Curr Opin Gastroenterol 2006;22:626–31.
. The arcuate nucleus as a conduit for diverse signals relevant to energy homeostasis. Int J Obes Relat Metab Disord 2001;25(Suppl 5):S63–7.
. Hypothalamic melanocortin neurons integrate signals of energy state. Eur J Pharmacol 2003;480:3–11.
. Distributed neural control of energy balance: contributions from hindbrain and hypothalamus. Obesity (Silver Spring) 2006;14(Suppl 5):216S–21S.
. Neuropeptides, food intake and body weight regulation: a hypothalamic focus. Peptides 2002;23:2283–306.
. Gut-brain axis: regulation of glucose metabolism. J Neuroendocrinol 2006;18:883–94.
. The direct and indirect controls of meal size. Neurosci Biobehav Rev 1996;20:41–6.
. The vagus nerve, food intake and obesity. Regul Pept 2008;149:15–25.
. Central melanocortin receptor agonist reduces spontaneous and scheduled meal size but does not augment duodenal preload-induced feeding inhibition. Physiol Behav 2002;77:411–16.
. A metabolic defect promotes obesity in mice lacking melanocortin-4 receptors. Proc Natl Acad Sci USA 2000;97:12339–44.
. The role of the dorsal vagal complex and the vagus nerve in feeding effects of melanocortin-3/4 receptor stimulation. Endocrinology 2000;141:1332–7.
. Neuroendocrine control of food intake. Nutr Metab Cardiovasc Dis 2008;18:158–68.
. Relation of obesity to consummatory and anticipatory food reward. Physiol Behav 2009;97:551–60.
. The drive to eat: comparisons and distinctions between mechanisms of food reward and drug addiction. Nat Neurosci 2012;15:1330–5.
. AGRP neurons are sufficient to orchestrate feeding behavior rapidly and without training. Nat Neurosci 2011;14:351–5.
. Lighting up the hypothalamus: coordinated control of feeding behavior. Nat Neurosci 2011;14:277–8.
. Effects of fructose vs glucose on regional cerebral blood flow in brain regions involved with appetite and reward pathways. JAMA 2013;309:63–70.
. Small decrements in systemic glucose provoke increases in hypothalamic blood flow prior to the release of counterregulatory hormones. Diabetes 2009;58:448–52.
. [Arterial spin labeling: state of the art]. J Radiol 2009;90:1031–7.
. Gene expression profiling of individual hypothalamic nuclei from single animals using laser capture microdissection and microarrays. J Neurosci Methods 2009;177:87–93.
. Obesity surgery: happy with less or eternally hungry? Trends Endocrinol Metab 2013;24:101–8.
. Is there evidence for a set point that regulates human body weight? F1000 Med Rep 2010;2:59.
. Sleeve gastrectomy induces loss of weight and fat mass in obese rats, but does not affect leptin sensitivity. Gastroenterology 2010;138:2426.
. Effects of the biliopancreatic diversion on energy balance in the rat. Int J Obes (Lond) 2006;30:419–29.
. Metabolic and neuroendocrine consequences of a duodenal-jejunal bypass in rats on a choice diet. Ann Surg 2009;249:269–76.
. Neurobiologic changes in the hypothalamus associated with weight loss after gastric bypass. J Am Coll Surg 2004;199:887–95.
. Making sense of it: roles of the sensory circumventricular organs in feeding and regulation of energy homeostasis. Exp Biol Med (Maywood) 2007;232:14–26.
. Peripheral administration of PYY(3–36) produces conditioned taste aversion in mice. Cell Metab 2005;1:159–68.
. Intra-abdominal vagal blocking (VBLOC therapy): clinical results with a new implantable medical device. Surgery 2008;143:723–31.
. Roux-en-Y gastric bypass reverses the effects of diet-induced obesity to inhibit the responsiveness of central vagal motoneurones. J Physiol 2013;591:2357–72.
. Resting energy expenditure and energetic cost of feeding are augmented after Roux-en-Y gastric bypass in obese mice. Endocrinology 2012;153:2234–44.
. Selective reduction in neural responses to high calorie foods following gastric bypass surgery. Ann Surg 2011; 253:502–7.
. Minireview: Hormonal and metabolic mechanisms of diabetes remission after gastrointestinal surgery. Endocrinology 2009;150:2518–25.
. Gastric volume rather than nutrient content inhibits food intake. Am J Physiol 1996;271:R766–9.
. Ghrelin is a growth-hormone-releasing acylated peptide from stomach. Nature 1999;402:656–60.
. Mechanisms in endocrinology: Ghrelin: the differences between acyl- and des-acyl ghrelin. Eur J Endocrinol2012;167:601–8.
. Plasma ghrelin levels after diet-induced weight loss or gastric bypass surgery. N Engl J Med 2002;346:1623–30.
. Fundus functionality and ghrelin concentrations after bariatric surgery. N Engl J Med 2004;350:308–9.
. Functional differentiation of human jejunum and ileum: a comparison of the handling of glucose, peptides, and amino acids. Gut 1974;15:444–9.
. Upper intestinal lipids trigger a gut-brain-liver axis to regulate glucose production. Nature 2008;452:1012–16.
. The mechanism of diabetes control after gastrointestinal bypass surgery reveals a role of the proximal small intestine in the pathophysiology of type 2 diabetes. Ann Surg 2006;244:741–9.
. Moderate effect of duodenal-jejunal bypass surgery on glucose homeostasis in patients with type 2 diabetes. Obesity 2012;20:1266–72.
. Surgery for nonobese type 2 diabetic patients: an interventional study with duodenal-jejunal exclusion. Obes Surg 2009;19:1077–83.
. Effects of bariatric surgery on glucose homeostasis and type 2 diabetes. Gastroenterology 2012;143:897–912.
. Bariatric surgery versus intensive medical therapy in obese patients with diabetes. N Engl J Med 2012;366:1567–76.
. Improvement in glucose metabolism after bariatric surgery: comparison of laparoscopic Roux-en-Y gastric bypass and laparoscopic sleeve gastrectomy: a prospective randomized trial. Ann Surg 2009;250:234–41.
. Gastric bypass vs sleeve gastrectomy for type 2 diabetes mellitus: a randomized controlled trial. Arch Surg 2011;146:143–8.
. Effectiveness of laparoscopic sleeve gastrectomy on glycemic control in obese Indians with type 2 diabetes mellitus. Surg Obes Relat Dis 2010;6:138–41.
. Sleeve gastrectomy and type 2 diabetes mellitus: a systematic review. Surg Obes Relat Dis 2010;6:707–13.
. Laparoscopic Roux-en-Y gastric bypass vs. laparoscopic sleeve gastrectomy for morbid obesity and diabetes mellitus: a meta-analysis of sixteen recent studies. Hepatogastroenterology 2013;60:132–7.
. Gastrointestinal regulation of food intake. J Clin Invest 2007;117:13–23.
. Gut-expressed gustducin and taste receptors regulate secretion of glucagon-like peptide-1. Proc Natl Acad Sci USA 2007;104:15069–74.
. Human duodenal enteroendocrine cells: source of both incretin peptides, GLP-1 and GIP. Am J Physiol Endocrinol Metab 2006;290:E550–9.
. Electrical activity-triggered glucagon-like peptide-1 secretion from primary murine L-cells. J Physiol 2011;589:1081–93.
. Glucagon-like peptide 1 promotes satiety and suppresses energy intake in humans. J Clin Invest 1998;101:515–20.
. Effect of truncated glucagon-like peptide-1 [proglucagon-(78–107) amide] on endocrine secretion from pig pancreas, antrum, and nonantral stomach. Endocrinology 1988;123:2009–13.
. Glucagon-like peptides 1 and 2 in health and disease: a review. Peptides 2013;44:75–86.
. Determinants of the impaired secretion of glucagon-like peptide-1 in type 2 diabetic patients. J Clin Endocrinol Metab 2001;86:3717–23.
. Separate impact of obesity and glucose tolerance on the incretin effect in normal subjects and type 2 diabetic patients. Diabetes 2008;57:1340–8.
. Incretin levels and effect are markedly enhanced 1 month after Roux-en-Y gastric bypass surgery in obese patients with type 2 diabetes. Diabetes Care 2007;30:1709–16.
. Exaggerated glucagon-like peptide-1 and blunted glucose-dependent insulinotropic peptide secretion are associated with Roux-en-Y gastric bypass but not adjustable gastric banding. Surg Obes Relat Dis 2007;3:597–601.
. Ileal interposition improves glucose tolerance in low dose streptozotocin-treated diabetic and euglycemic rats. Obes Surg 2009;19:96–104.
. Ileal interposition surgery improves glucose and lipid metabolism and delays diabetes onset in the UCD-T2DM rat. Gastroenterology 2010;138:2437.
. Ileal interposition improves glucose tolerance and insulin sensitivity in the obese Zucker rat. Am J Physiol Gastrointest Liver Physiol 2010;299:60.
. Effects of liraglutide in the treatment of obesity: a randomised, double-blind, placebo-controlled study. Lancet 2009;374:1606–16.
. Vertical sleeve gastrectomy is effective in two genetic mouse models of glucagon-like Peptide 1 receptor deficiency. Diabetes 2013;62:2380–5.
. Inhibition of food intake in obese subjects by peptide YY3–36. N Engl J Med 2003;349:941–8.
. Gut hormone PYY(3–36) physiologically inhibits food intake. Nature 2002;418:650–4.
. Efficacy and safety of intranasal peptide YY3–36 for weight reduction in obese adults. J Clin Endocrinol Metab 2007; 92:1754–7.
. Differential effect of PYY1–36 and PYY3–36 on gastric emptying in man. Regul Pept 2009;158:57–62.
. Gastrointestinal hormones in short bowel syndrome. Peptide YY may be the ‘colonic brake’ to gastric emptying. Gut 1996;39:267–72.
. Effects of peptide YY and neuropeptide Y on gastric emptying in man. Digestion 1984;30:255–62.
. Roux-en-Y gastric bypass enhances energy expenditure and extends lifespan in diet-induced obese rats. Obesity (Silver Spring, Md) 2009;17:1839–47.
. Weight-independent effects of roux-en-Y gastric bypass on glucose homeostasis via melanocortin-4 receptors in mice and humans. Gastroenterology 2013;144:580–90.
. Long-term persistence of hormonal adaptations to weight loss. N Engl J Med 2011;365:1597–604.
. Human gut microbiota in obesity and after gastric bypass. Proc Natl Acad Sci USA 2009;106:2365–70.
. Metabolic surgery profoundly influences gut microbial-host metabolic cross-talk. Gut 2011;60:1214–23.
. The importance of the gut microbiota after bariatric surgery. Nat Rev Gastroenterol Hepatol 2012;9:590–8.
. Obesity and bariatrics for the endoscopist: new techniques. Therap Adv Gastroenterol 2011;4:433–42.
. Open-label, sham-controlled trial of an endoscopic duodenojejunal bypass liner for preoperative weight loss in bariatric surgery candidates. 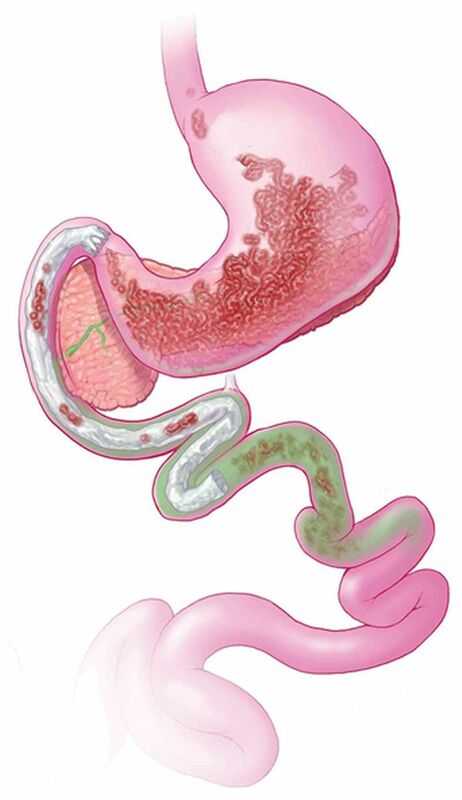 Gastrointest Endosc 2010;71:976–82.
. A multicenter, randomized efficacy study of the EndoBarrier Gastrointestinal Liner for presurgical weight loss prior to bariatric surgery. Ann Surg 2010;251:236–43.
. A pilot study of the duodenal-jejunal bypass liner in low body mass index type 2 diabetes. J Clin Endocrinol Metab 2013;98:E279–82.
. Endoscopic Duodenal-Jejunal Bypass Liner Rapidly Improves Plasma Parameters of Nonalcoholic Fatty Liver Disease. Clin Gastroenterol Hepatol 2013;11:1517–20.
. Endoscopic duodenal-jejunal bypass liner rapidly improves type 2 diabetes. Obes Surg 2013;23:1354–60.
. Role of proximal gut exclusion from food on glucose homeostasis in patients with Type 2 diabetes. Diabet Med 2013;30:1482–6.
. Endoscopic sleeve gastroplasty: a potential endoscopic alternative to surgical sleeve gastrectomy for treatment of obesity. Gastrointest Endosc 2013;78:530–5. Contributions AA, BKA-D and MC were responsible for study conceptualisation and writing of manuscript. JDP was responsible for writing of manuscript. Funding National Institutes of Health to MC for studies in obesity (NIH RO1- DK67071).